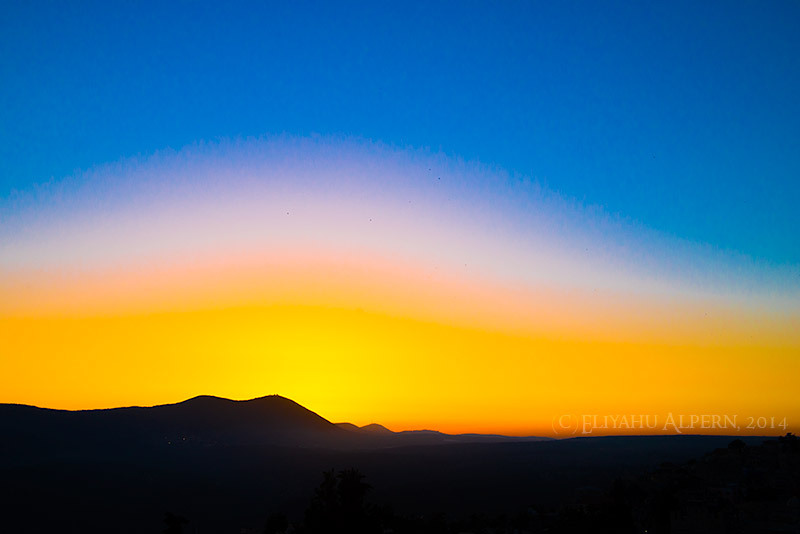 This is an image of sunset over the Mount Meron range which I shot from the roof of my studio in Tzfat, Mystic Mountain Studio. Mount Meron is the burial place of many ancient teachers and mystics of the Jewish People including Shimon Bar Yochai, author of The Zohar, the main text of the Kabbalah, and Hillel the Elder one of the greatest teachers in history. The tiny black specks you see in the image are not dust particles, they are birds flying over Nahal Amud, the Amud River Bed. (C) 2014 Golem Productions, all rights reserved.